What are Infrared and Red Light Therapies? You probably have seen some ads like these: “Red light therapy for hair loss” or “Red light therapy for cellulite”. Although these taglines sound a bit gimmicky, there is, actually a pretty solid scientific evidence supporting many red light therapy benefits. Does infrared light therapy work? Red Light therapy (LLLT -Low-Level Laser therapy) really helps with Eczema and Psoriasis! The best of all is that many of these Red Light therapy devices are really affordable. Nowadays almost anyone can them for DIY red light therapy at home! 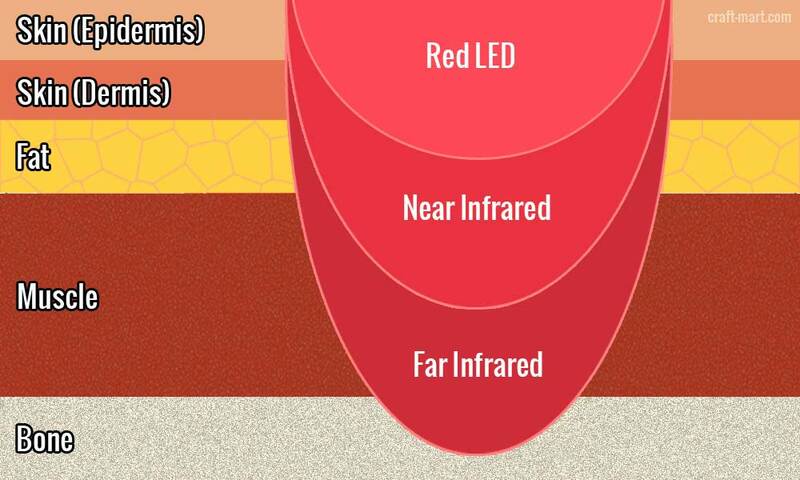 In reality, the health benefits from some of them are quite different because near infrared, far infrared, and visible red waves have very different light spectrum wavelength. Thus, Red Light Therapy benefits include benefits from all visible and invisible types of red light. But when we mention Infrared Light Therapy benefits it means that we are talking about this particular invisible portion of red light only. The longer the wavelength, the deeper red light penetrates to deliver energy to the cells, promoting healing and relieving pain. Various tissue types and, of course, cells each possess their own unique light absorption methods at different wavelengths. The most common, safe, and affordable Near Infrared Radiation Therapy (NIR) is done with LED technology that offers the lowest surface temperature. LED devices generate incoherent light waves that disperse over a wider surface area than a RED light halogen or laser. Such waves only have enough power to penetrate the skin making many portable and very affordable LED devices perfect to be used for DIY red light therapy for cellulite in the comfort of your home. Red Lasers emit polarized light, more powerful than LED. If can go deeper into the tissue but with some risk of accidental eye injury. 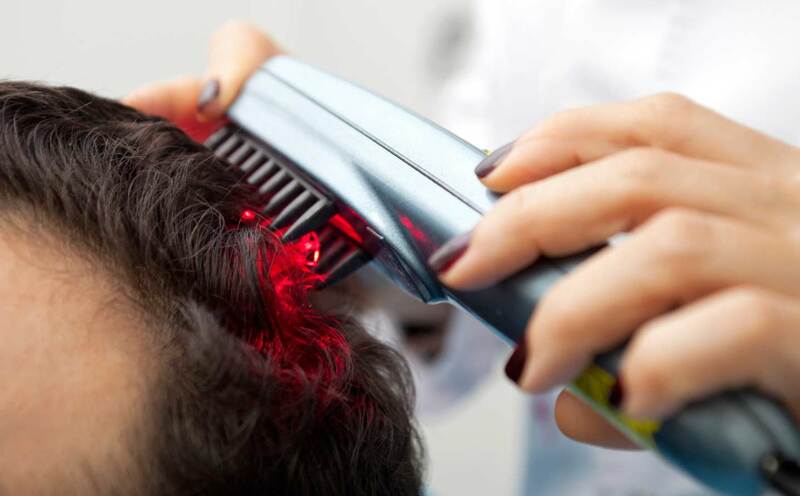 Red light therapy for hair loss often employs devices such as helmets with built-in multiple red lasers sometimes mixed with red LEDs. Devices that work within invisible red light spectrum produce waves that go up to 2 inches deep and offer a wider range of well-studied and documented health benefits comparing to LED therapy. When you go out to sunbathe, the heat that you feel is called infrared light. You might only feel the heat just on your skin, but it penetrates all the way to your tissues, bones, muscles, and nerves as well. Technically, there is a standard wavelength of light that is used in infrared light therapies. Doctors, physical therapists, and professional athletes mostly use infrared light therapy to relieve pain and reduce inflammation. Various infrared light devices in the market can be used at home. High permeability increases inflammation; infrared light therapy reduces inflammation by reducing the permeability. Arthritic joints can be treated using infrared light therapy since they are close to the skin. This form of treatment is natural and with no known side effects thus making it more reliable than the anti-inflammatory drugs. Once the infrared waves have penetrated into your body, the temperature of your body will naturally start rising. This will cause your blood circulation to speed up rapidly. Thus, the pain-relieving components in the blood will reach the affected areas fast and create a quicker relieve. This therapy relieves even severe pain such as that caused by arthritis. Chronic wounds are life-threatening since they are prone to infections. No one would ever wish for an amputation, but sadly that is what is done when an injury gets infected. You do not have to let your wound get to this traumatizing point. Infrared light therapy can speed-up the healing process of a wound by up to 200%. You might be wondering how this works. During this treatment, the wound is supplied with more oxygen and nutrients that facilitate fast and natural healing of the injury. Infrared light therapy increases the blood circulation in the body which promotes the getting rid of dead and damaged cells. During this cleanup, bacteria are eradicated too and thus the wound gets to heal faster. 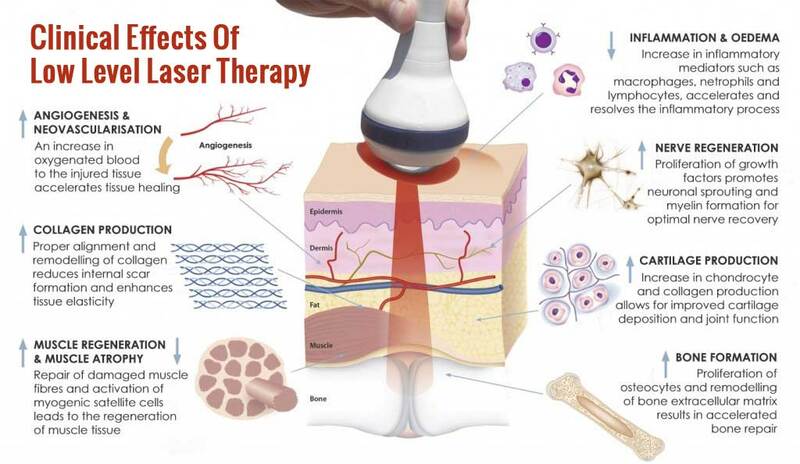 This treatment increases activities of the lymph system which, in return, promotes detoxification of the affected area. Detoxification gets rid of all the impurities in the wound and promoting speedy recovery process. The infrared light penetrates into the skin to the cellular mitochondria where it is absorbed and increases the production of ATP energy production in return. This promotes the body cells activities which hasten the healing of the wound. White light- reduces inflammation and makes the skin tighter. It penetrates deeper than any other color. Can infrared light therapy be used on pets? Yes, Infrared light therapy is safe for pets. This non-medication form of treatment has been used by veterinaries to treat pets since the 1980s. Just like in humans, the infrared light penetrates the skin layer of animals. Infrared light therapy can, therefore, relieve them from pain and inflammation. It is also used for treating wounds and speed up recovery. Check out this canine light therapy pad from Equine Light Therapy. However, you will need to shave the fur or hair of your pet for the infrared light to penetrate the skin. Remember, there will be no health benefit gained from the therapy if the light does not get through the surface. Ensure you know the recommended dosage before you use any infrared light therapy device at home. Mostly this will be indicated in the device manual. The strength of the light intensity will determine the period you will use the device to achieve a certain dosage. The higher the dosage, the more effective it will be since it will penetrate deeper. Are there any side effects of infrared light therapy and is it safe? provides a safe, non-ablative, non-thermal, atraumatic photobiomodulation treatment of skin tissue with high patient satisfaction rates. Infrared light therapy is a reliable and budget-friendly treatment that is considered safe for everyone by healthcare practitioners. How much does each infrared light therapy session cost? The fee for treatment is set by individual clinics and can be from $35 – $75 per one-hour treatment session. Always consult your doctor first before starting any infrared or red light therapy, especially if you are pregnant, taking drugs that increase light sensitivity, or if you have a chronic health condition. Seek a physician’s advice before using any infrared light devices on infants or young children. Using the device on an open wound is not advised. The heat will cause bleeding due to the increased circulation. One therapy session should not go beyond recommended forty minutes and should be administered by a trained professional. Ensure you read the manual of the device for proper usage and discussed it with your health professional before any infrared light therapy. Are there any products on the market that utilize Infrared Light Technology? 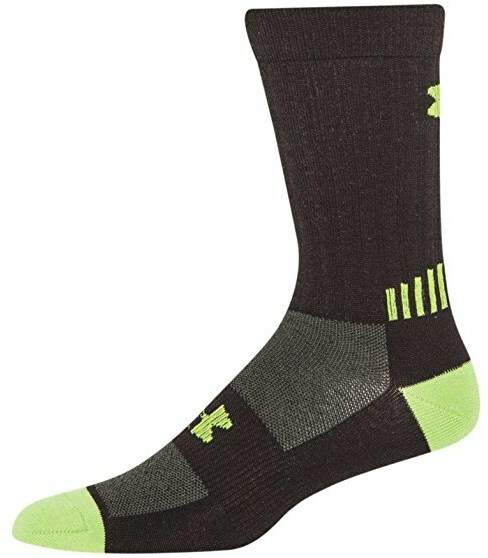 Check out these socks designed so that Infrared Light Reflective technology is built-into the fabric. Comparison of the effects of 665 nm low-level diode Laser Hat versus and a combination of 665 nm and 808nm low-level diode Laser Scanner of hair growth in androgenic alopecia.